The Dorothea Dix Volunteer Service Guild, a non-profit volunteer organization, was formed in 1961, training volunteers to work at the mental health care facility, Dorothea Dix Hospital. The Guild helped the public understand the work of Dorothea Dix Hospital, as well as improve the quality of life for the patients of the hospital. Bulk of materials consists of minutes for the Guild committees and Executive Board meetings covering 1961 through 2011. Other materials include the Guild publications Volunteer Ventures, June 1967 through June 2008, and the Yearbooks, 1973 to 2008, as well as scrapbooks covering 1960 to 1991. The Dorothea Dix Volunteer Service Guild, a non-profit volunteer organization, was formed in 1961, training volunteers to work at the mental health care facility, Dorothea Dix Hospital, until 2008. The Guild helped the public understand the work of Dorothea Dix Hospital, as well as improve the quality of life for the patients of the hospital. x.53.1 Scrapbooks, 1960-1991. Chronological within each record type. Please Note: Due to the fragile nature of the scrapbooks, they have been microfilmed and WITHDRAWN from use. Please refer to microfilm reel X.53.1. Scrapbooks have been microfilmed and withdrawn. Please refer to X.53.1. Begun in 1961, the purpose, in part, of the Dorothea Dix Volunteer Service Guild was to assist in interpreting the aims, policies and total program of the Dorothea Dix Hospital to the public, and to help meet the many material needs of the patients, supplying comforts and facilities not provided by State funds. Active for nearly half a century, with the aid of thousands of volunteer hours, the Guild was hugely successful in these aims, completing several large projects at the hospital and improving the quality of life for the patients in many ways. There had always been a need for volunteer help at Dorothea Dix Hospital, since its opening in 1856, and several church and civic groups had provided people to fill this need. On September 1, 1960, Ann Abernathy became the first Volunteer Service Director of Dorothea Dix Hospital, recruiting volunteers and assigning them to specific jobs open to the volunteers. On April 18, 1961, the name Dorothea Dix Volunteer Service Guild was adopted. The first officers elected were Mrs. Wymene Valand, President; Barbara Wright, Vice-President; Mrs. L.P. Richardson, Secretary; and Ernestine Freas, Treasurer. By the end of the first year, 169 volunteers had given 2,155 hours of their time, and by 1970 the Membership included 275 people contributing 12,941 hours to the Hospital. On May 9, 1961, a constitution and by-laws were written for the Guild. In September the red cobbler apron was chosen as the Volunteer uniform. In December that year, at the request of the Hospital Board of Controls, the Guild voted to accept management of the Hospital Canteen. The Canteen sold snacks and beverages and was open to the Hospital staff, the volunteers, and the patients as well. The Canteen was scaled down to a cart in 1977, and stayed open until April of 1997 when the drop in the number of available volunteers forced the Guild to close the Canteen altogether. On June 25, 1963, the Guild was incorporated as Dorothea Dix Volunteer Service Guild, Inc. The newsletter Volunteer Ventures began publication in June of 1967 and continued until June 2008, summarizing the activities of the Guild. Throughout its 47 years of existence, the Guild raised money for many special projects, one of which was the "Forgotten Patient," later called "Sponsored Patient," project. This provided patients with a small allowance to spend at the Canteen, and provided personal items they would not have otherwise. The Christmas Committee made sure that each patient received a Christmas gift each year. The Clothing Station gave three complete outfits to each patient who was ready to leave the Hospital. The Guild started the Flower Cottage which provided flower arrangements for patients and staff as well as garden therapy. After the renovation of the Scott Building, the Addie A. Brannan Library for patients was opened on September 29, 1970. In 1978 the Guild announced to Hospital Administration that it had $8,000.00 available for a major project for the Hospital. The hospital requested that the Guild concentrate in three areas. The first area was a park to be developed on Umstead Drive below the Kirby Building; the second area of the project was improvement to the Library; and the third project area was the central recreation area, formerly known as the Rose Room. These projects were completed in the fall of 1981. In October of 1976, the office facilities of the Guild were moved to the Hunter House, called "Spring Hill." This was the plantation home built by Theophilus Hunter, Jr. in the early 1800's on the land that in 1850 was purchased by the state for Dorothea Dix Hospital. Spring Hill was entered on the National Register of Historic Places in December of 1983, and the Guild was able to keep its offices in this building until 2000. Then, after two years of being displaced, the Community Relations Department and the Dorothea Dix Volunteer Service Guild moved to a permanent home on Palmer Drive in 2002. This was the 1884 House of Many Porches which was renovated and decorated under the supervision of Fay McArthur, Director of Community Relations. Over the years honorary membership in the Guild was bestowed upon deserving individuals, including Mrs. Robert Scott, wife of Governor Scott, and Mrs. Pat Taylor, wife of the Lt. Governor. In 2007, the Legislature voted to close Dorothea Dix Hospital, and this meant the end of the need for the Guild in Raleigh. The Guild continued their work and remained active in 2008, and holding meetings through 2011. [Identification of item], ORG.174, Dorothea Dix Volunteer Service Guild, State Archives of North Carolina, Raleigh, NC, USA. Records were received from the President of the organization, September 2008. 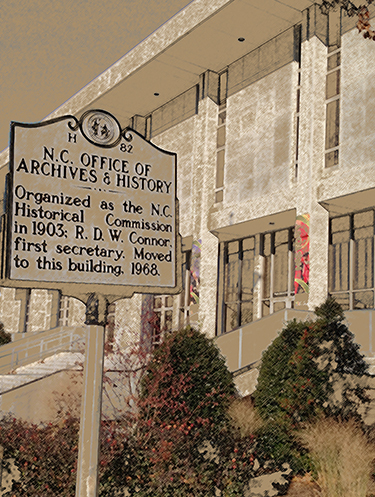 This collection contains the general records of the Guild, which operated in Raleigh, Wake County, North Carolina. This collection is divided into nine series, general records, minutes, financial statements, Volunteer Ventures, yearbooks, miscellaneous, photographs, Marjorie O'Rorke Papers, and scrapbooks. There had always been a need for volunteer help at Dorothea Dix Hospital, since its opening in 1856, and several church and civic groups had provided people to fill this need. On September 1, 1960, Ann Abernathy became the first Volunteer Service Director of Dorothea Dix Hospital, recruiting volunteers and assigning them to specific jobs open to the volunteers. On April 18, 1961, the name Dorothea Dix Volunteer Service Guild was adopted. The first officers elected were Mrs. Wymene Valand, President; Barbara Wright, Vice-President; Mrs. L.P. Richardson, Secretary; and Ernestine Freas, Treasurer. By the end of the first year, 169 volunteers had given 2,155 of their time, and by 1970 the Membership included 275 people contributing 12,941 hours to the Hospital. On June 25, 1963, the Guild was incorporated as Dorothea Dix Volunteer Service Guild, Inc. The newsletter Volunteer Ventures began publication in June of 1967 and continued until June 2008, summarizing the activities of the Guild. Throughout its 47 years of existence, the Guild raised money for many special projects, one of which was the Forgotten Patient, later called Sponsored Patient, project. This provided patients with a small allowance to spend at the Canteen, and provided personal items they would not have otherwise. The Christmas Committee made sure that each patient received a Christmas gift each year. The Clothing Station gave three complete outfits to each patient who was ready to leave the Hospital. The Guild started the Flower Cottage which provided flower arrangements for patients and staff as well as garden therapy. After the renovation of the Scott Building, putting jackets on books, and learning library methodology, the Addie A. Brannan Library for patients was opened on September 29, 1970. In 1978 the Guild announced to Hospital Administration that it had $8,000.00 available for a major project for the Hospital. The hospital requested that the Guild concentrate in three areas. The first area was a park to be developed on Umstead Drive below the Kirby Building; the second area of the project was improvement to the Library; and the third project area was the central recreation area, formerly known as the Rose Room. These projects were completed in the fall of 1981. Over the years, Honorary membership in the Guild was bestowed upon deserving individuals, including Mrs. Robert Scott, wife of Governor Scott, and Mrs. Pat Taylor, wife of the Lt. Governor. This collection is divided into nine series, general records, minutes, financial statements, Volunteer Ventures, yearbooks, miscellaneous, photographs, Marjorie O'Rorke Papers, and scrapbooks. General Records includes the articles of incorporation for the Guild, by-laws, the agreement between the Guild and the Hospital, officers handbooks, policies and procedures, a history of the Guild written in 1986, volunteer manuals, correspondence, memorandums, and articles of dissolution. Minutes includes minutes from the Guild membership meetings, Executive Board meeting minutes, Executive Committee minutes, Treasurer reports, and various committee minutes and reports. Also, when available, the President's report and the annual report for the Membership. This series is arranged chronologically, with the Guild fiscal year running from May 1 through April 30. Financial Statements includes annual reports from independent audits of the balance sheet of the Guild, statement of income and expenses, bank statements and invoices. Publications includes Volunteer Ventures, the newsletter published monthly or semi-monthly by the Guild from June 1967 through June 2008, summarizing the activities of the Guild for the Membership, and Yearbooks, published annually by the Guild, outlining the Guild programs, listing the Executive Committee and Board of Directors members, and listing the Membership. Miscellaneous includes various materials which do not properly belong in any other series. This includes subject files on various topics arranged alphabetically. Photographs includes loose photographs from various dates, many of which are unidentified. Most are color photographs and some are quite faded. The scrapbook for 2000-2001 is included in this series. Scrapbooks contain newspaper clippings, photographs, and papers from the various Guild activities. PLEASE NOTE: Due to the fragile nature of the scrapbooks, they have been microfilmed and WITHDRAWN from use. Please refer to microfilm reel X.53.1. Publications includes the Guild newsletter and yearbooks. Volunteer Ventures is a newsletter published monthly or semi-monthly by the Guild from June 1967 through June 2008, summarizing the activities of the Guild for the Membership. The yearbooks were published annually by the Guild, outlining the Guild programs, listing the Executive Committee and Board of Directors members, and listing the Membership. Various materials which do not properly belong in any other series. Miscellaneous includes various materials which do not properly belong in any other series. These include subject files on various topics arranged alphabetically. Photographs includes loose photographs from various dates, many of which are unidentified. Most are color photographs and some are quite faded. Scrapbooks contain newspaper clippings, photographs, and papers from the various Guild Activities. These scrapbooks have deteriorated over time, and have been microfilmed and withdrawn from use. Please refer to microfilm reel X.53.1.